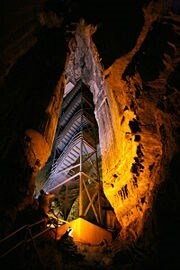 Mammoth Cave Is The World's Longest Cave! More than 320, 340, 360, 370 miles of passages have been mapped and the surveyors press on! To get an idea of how long Mammoth Cave is, consider this: the second longest cave in the world, Optimisticeskay Cave, in the Ukrainskaya region of the former Soviet Union, is only 119.2 119.3 miles long. Mammoth Cave is three times longer. And not only is the cave the longest in the world, but cave mappers believe the cave system will eventually prove to be 560 miles long! 350 million years ago was a very different time than today. The North American continent was located much further south; at that time Kentucky was about 10 degrees south of the equator, and a shallow sea covered most of the southeastern United States. The warm waters supported a dense population of tiny organisms whose shells were made of calcium carbonate (CaCO3). As these creatures died, their shells accumulated by the billions on the floor of the ancient sea. In addition, calcium carbonate precipitated from the water itself. The build-up of material continued during the next 70 million years until some seven hundred feet of limestone and shale was deposited. Late in the deposition of the limestone, about fifty to sixty feet of sandstone was deposited over much of the area by a large river system that emptied into the sea from the north. About 280 million years ago, the sea level started to drop and the continent began to rise, exposing layers of limestone and sandstone. 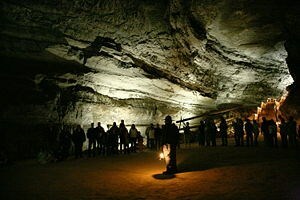 The stage was set for the formation of the Mammoth Cave. Forces at work beneath the earth's crust caused it to slowly rise, buckle and twist, causing tiny cracks between and across layers of limestone and sandstone. At the same time river systems as we know them today slowly developed. 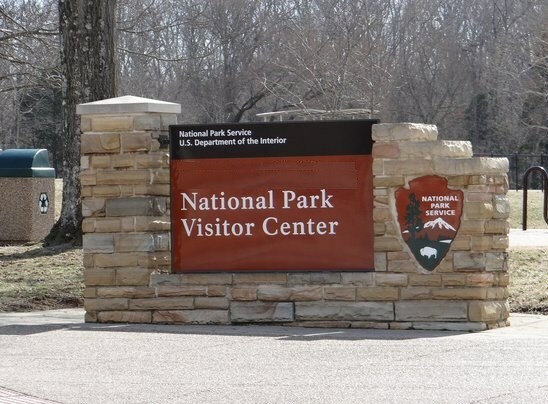 By about three million years ago a sandstone-capped plateau stood above the Green River, and a low, almost flat limestone plain extended southeast of what is now Interstate 65. Rain water, acidified by carbon dioxide in the soil, seeped downward through millions of tiny cracks and crevices in the limestone layers. This weak carbonic acid (the same acid as in soda pop) dissolved a network of tiny microcaverns along the cracks. As the land continued slowly rising, the Green River eroded its channel deeper. 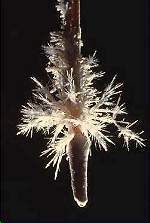 The water in the network of microcaverns drained through the limestone under the plateau toward the river. Just as rivulets converged into streams above ground, water flow paths through the limestone also converged into incrementally larger flow paths. Mammoth Cave is Still GROWING. As rainwater continued to enter the system and more limestone was dissolved, the microcaverns enlarged. Because the major drains carried the most water, they enlarged the most. Caves were forming. As the Green River cut deeper, the water table continued dropping to the same base level as the Green River. New underground drains formed at levels lower than the older ones, and the older channels emptied. Thus the oldest cave passages are the closest to the surface, and the youngest horizontal passages are the deepest underground. At the present water table, cave passages are still being formed. You'll never see anything quite like this again! Share a photo of your visit with others (optional). Post a pic of yourself or your GPSr at the listed coordinate -or- the park feature you enjoyed most. And to demonstrate the educational value of this Earthcache, please email answers to the following questions to ARF!. 1. 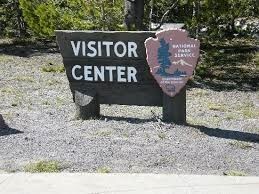 How many miles was Mammoth Cave at the time of your visit? 2. How many feet of sandstone were deposited during the formation? 3. 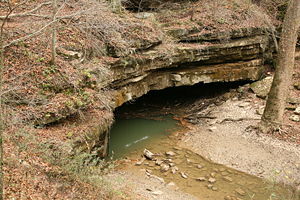 What process created the caves and caverns of kentucky? 4. Which of the images below (A1, A2, A3) represent the example seen here? 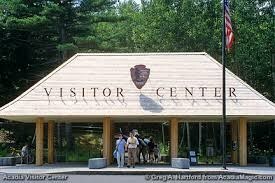 Any park ranger can help with questions #1, #2, and #3. Answer to #4 is at the coordinates. Do not post answers in your log. As always, logs not followed by answers within 48 hours will be removed. You can always log again when prepared. Do not wait on a reply from me. Log your visit. FINDS which do not meet logging requirements will be quietly removed! We hope this was a FAVORITE stop! Take Some Knowledge, Leave No Trace!